Beautiful crystal clear water, brilliant white soft sand, stellar sunsets, private cabanas and poolside drinks.....sounds like a perfect vacation to me. One I would travel into international waters for. Yet on a very lucky Saturday, I found all of this less than 30 minutes from home at the Hyatt Regency, Clearwater. My best friend Keri came into town and we decided to take a quick trip over to the #1 Beach in America, voted by USA Today. We were fortunate to get a private poolside cabana at the Hyatt Regency, Clearwater. After being welcomed with a glass of champagne, we headed to our cabana. Check out the video below for a tour. To say we were speechless is an understatement. We were both expecting a few chairs in a private area. 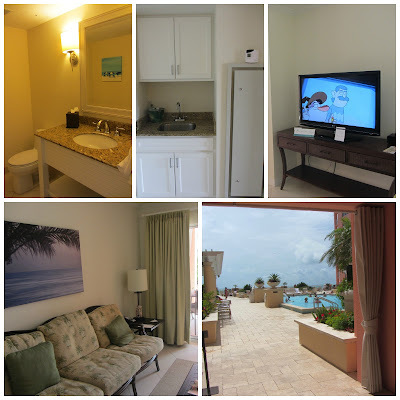 By no means did either of us expect to find ourselves in a standard sized hotel room with air condition, personal service, private bathroom, TV and a couch plus sitting area. The private veranda was adjacent to the pool and had views of the ocean when you were standing. This would be perfect for a bacherlorette/bachelor party or for those with kids. Prices vary on the date and size of the room, but you do not have to be a guest at the hotel to book a cabana. We found ourselves quite thirsty after laying out for a little while. Although Keri is following the Paleo diet, she decided to make this a cheat meal and order a giant drink. 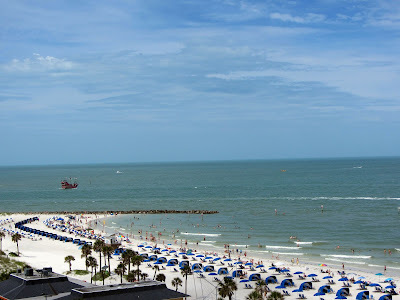 We relaxed with our poolside drinks and enjoyed the scenery of Clearwater Beach from our beach chairs. 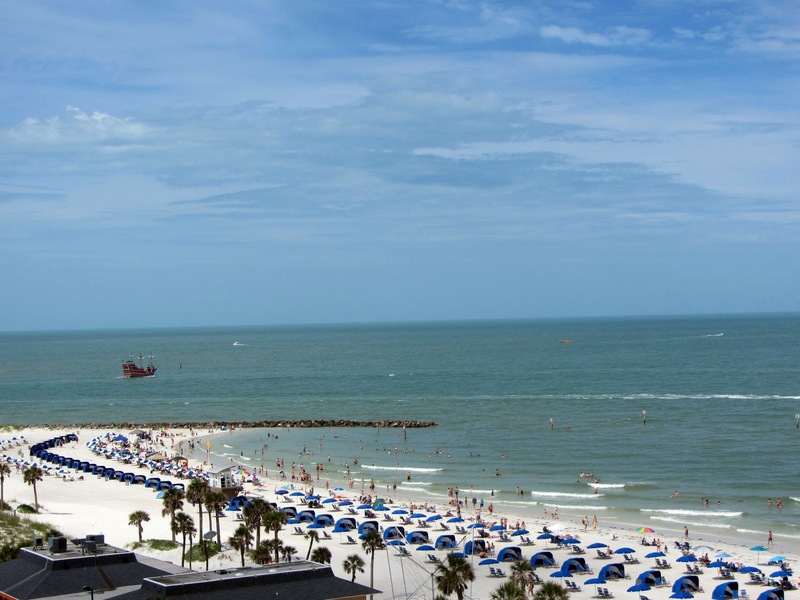 Since the pool at Hyatt Clearwater is located on the 8th Floor, you get amazing panoramic views of this spectacular Beach. If you are here at at sunset, you will find yourself with some of the best views around town. When it came time for lunch, we went with our servers suggestion and ordered the hand blended guacamole. It had amazing flavor and reminded us both of tableside guacamole we had on our last trip to the Bahamas. I couldn't resist from ordering Grouper Nuggets with Chipotle cocktail sauce. Grouper nuggets (or grouper bites) is a weakness of mine. They were lightly battered and fried. Perfectly crispy little nuggets of white fish. Sorry about your diet Keri....I guess I am a paleo buster. 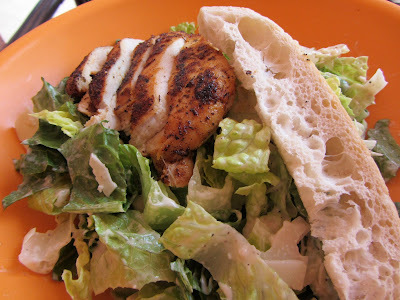 For Keri's lunch, she ordered the blackened jerk seasoned chicken ceaser salad. 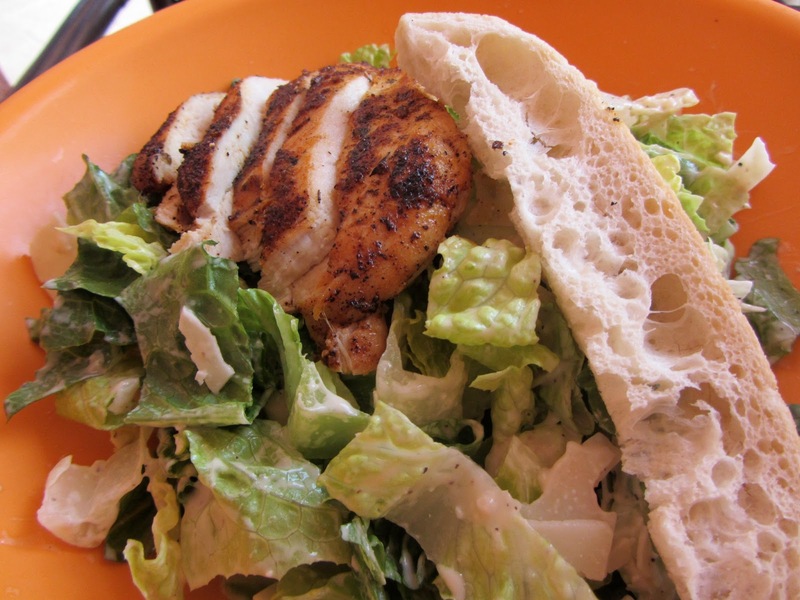 I am personally very selective over ceaser salads and this one got the approval from both of us. 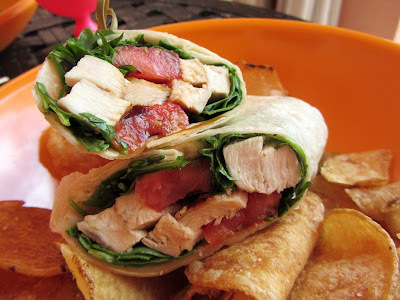 I opted for the Chicken, Grilled Watermelon & Arugula Wrap with cilantro mojo. I usually find wraps lacking flavor but that was not the case here. The grilled watermelon may be my new favorite thing. I am not a fan of raw tomatoes and the grilled watermelon is a perfect substitution. The wrap was served with evil homemade chips, which I ate too many of. 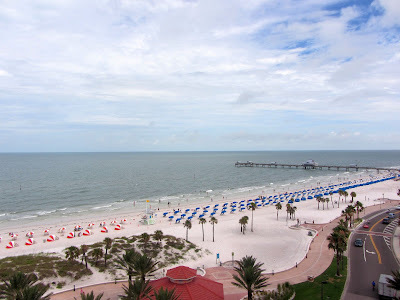 After devouring our lunches, we headed off to the beach, rented two chairs and an umbrella and took a long walk down the soft white sand of Clearwater. At this point in the day, the beach was very busy. I am from Daytona Beach and even during our busiest time of year, I have never seen so many people on the beach. I was looking forward to going back to the 8th floor where it was not crowded and I could still look at the beach. The clouds started rolling in and we decided to head back up to our cabana. Not before ordering one last drink. 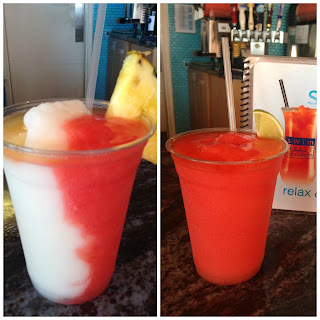 Keri ordered a Miami Vice which is 1/2 pina colada and 1/2 strawberry daiquiri while I ordered a traditional strawberry daiquiri. We took advantage of the private veranda with drinks in hand and people watched for the remainder of the day. SWIM Bar and Grill is open to the public for lunch and dinner. They have daily specials and is the perfect location for watching the famous Clearwater Sunset. The service was incredible. 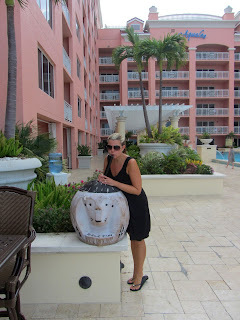 Everyone was super friendly and I can see why this is a top rated hotel in Clearwater. Here are the current drink specials found at SWIM! Everyday: The half hour before sunset and the half hour after sunset - two for one, classic margaritas, sangria and draft beers. I love that they used grilled watermelon in the wrap. Super unique! I always tell my bf that we don't fully appreciate that we live so close to the beach. Your stay-cation looked lovely! Isn't the grilled watermelon a fantastic idea! You should take advantage of our beaches for sure. We don't do it often enough ourselves. Love this place! Great food, great atmosphere and great beach! I loved it there. It was my first time actually going and laying out on Clearwater! whoaa that wrap looks delicious! Definitely something to try and recreate :) I'd love to just spend a Sunday lounging and relaxing here! I see plenty of grilled watermelon in my future!! It was a very relaxing day for sure! Sounds like a wonderful way to spend a girl's weekend to me! I am thinking that watermelon and arugula wrap needs to be in my life: how unique!